Yes, I’m an opera novice—I’ve seen only three other operas by Giacomo Puccini: La Boheme, Tosca, and Madama Butterfly (see my post of 31 May 2012). None of these prepared me for the showy spectacle of Turandot by the Seattle Opera which my wife and I attended on 5 August at McCaw Hall. And the three others set me up to expect Turandot to end in a very different way. Speight Jenkins is my opposite. He’s been attending opera for more than 60 years and is General Director of the Seattle Opera. 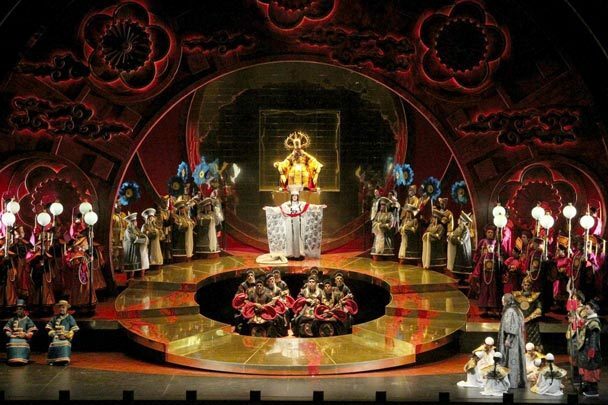 In the August edition of “Encore Arts Programs,” he writes that Turandot was a smash hit when it premiered at Teatro Alla Scala in Milan, Italy on 25 April 1026, sixteen months after Puccini’s death. It scored successes everywhere it was performed, but inexplicably, it disappeared from New York opera after 1930 until it was resurrected in 1961 by the Metropolitan Opera. Nine performances were given that season, evoking ovation after ovation, and “suddenly Turandot leapt onto the gold standard.” According to orchestra conductor Asher Fisch, Puccini operas are so popular that the composer accounts for 25 percent of all the operas produced today (see http://seattletimes.nwsource.com/html/thearts/2018771976_opera29.html). Puccini died in December, 1924, before finishing Turandot. He left few notes about how he intended to end it. Others finished both the music and libretto. Hence, for me, the surprise ending. Turandot, based on a Persian fairy tale and set in China, is the story of an icy, man-hating princess named Turandot (soprano). No man shall possess me, she declares, yet there is pressure from the emperor and the people for her to marry. So, if any man of royal blood can solve three riddles, she agrees to marry him. If a man tries and fails, he will be killed. By the time Prince Calaf (tenor) arrives, 40 suitors have been decapitated. He is confident, in love with her, and determined to succeed. He solves the riddles. She still resists, however, so he gives her a means of escape: if by the next dawn she cannot give his name, he will tell it to her and become her 41st victim. Lui, the self-effacing, sacrificing woman who is caretaker of Calaf’s father, is tortured during the night to make her reveal his name. Such is her love for Calaf that she dies rather than do so. 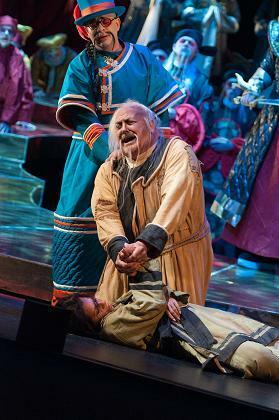 Dawn comes and Calaf tells Turandot his name. Meanwhile, she admits to being attracted to him, unlike any of the others, and in the climax, declares her love and agrees to marry him. The emperor and the people rejoice! So, to me, Turandot is different. Not only is it a grand spectacle in which the heroine doesn’t die in a tragic ending, but musically, Puccini pushes the soprano and tenor toward the limits of the range of the human voice. The roles require a full, dramatic, powerful, heroic sound. I may be wrong, but it seems to me there also is more dissonance in the orchestra, which can be almost overpowering at times, and fewer melodies in the score. Here, Puccini is more akin to Wagner than in the other three Puccini operas I’ve attended. Performance photos are courtesy of the Seattle Opera. Please click on any picture to enlarge it. This entry was posted on August 31, 2012 at 8:25 pm	and is filed under Professional Concerts. Tagged: Giacomo Puccini, Jose Carreras, La Boheme, Luciano Pavarotti, Madama Butterfly, McCaw Hall, Nessun dorma, Placido Domingo, Prince Calaf, Seattle Opera, Speight Jenkins, Tosca, trumpet, Turandot. You can follow any responses to this entry through the RSS 2.0 feed. You can leave a response, or trackback from your own site. To Odd Helge Lindseth: I appreciate the compliment, and I’m glad to discover your blog!